Luckily for me, the splendid string bassist / singer / creative catalyst Jen Hodge is of a forgiving disposition, or else I would be nervous about reviewing her splendid EP, CHRISTMAS TREATS, on December 29. But my semester ended a week ago, and it took intensive therapy to get the student essays and grading out of my system. So here I am, a week and more too late. BUT the good news is that the music — if you were to play it for someone who didn’t know it was Official Holiday Music — is simply gratifying hot melodic jazz, with surprising twists. CHRISTMAS TREATS features four tracks — including SANTA CLAUS BLUES, they are a Bechet-inspired IL EST NE, LE DIVIN ENFANT; JOLLY OLD SAINT NICHOLAS; GOD REST YE, MERRY GENTLEMEN. And they rock — the overall effect is hot lyricism with beautiful melodic statements and just the right blend of rocking collective improvisation. Jen is very proud of the lineup — each track features musicians from Western Canada’s hot jazz scene, their ages from 18 to 89, including Jen herself, Brad Shigeta, Lloyd Arntzen, Sky Lambourne, Arnt Arntzen, Nick James, Aaron Levinson, Dave Taylor, Ben Henriques, Bonnie Northgraves, Kayden Gordon, Joseph Abbott, Don Ogilvie, Josh Roberts, Kelby MacNayr. Some of these names were completely new to me, but the music is convincing throughout. Nothing on this diminutive but affecting disc is formulaic: neat arranging touches uplift without being overly clever: duets and duels between two of the same instruments; interludes for horns without rhythm within a performance — and a consistently swinging result. You didn’t hear anything this good at the mall, and this music will still be very tasty when all the ornaments are packed away. Visit here to get a digital copy, or travel to Jen’s hot homeland for a physical copy at any of her shows. And here’s Jen on Facebook. Whether it’s collective improvisation or a soaring solo episode, jazz has the power to make us even more glad to be alive. The last two Sunday nights at The Ear Inn were thrilling examples of musical and spiritual energy. 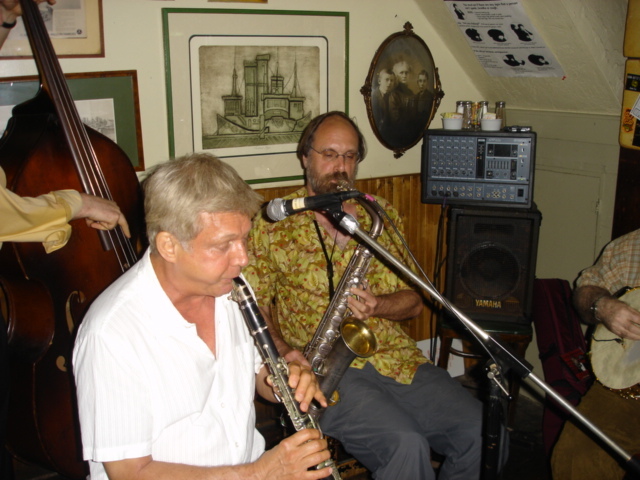 On June 1, the Earregulars were led by New Orleans clarinetist Orange Kellin, who, quietly and without fanfare, recreated the hot Wednesday night band from the much-missed Cajun: banjoist-singer Eddy Davis, Scott Robinson on C-melody sax (atypically, playing only one instrument), bassist Kelly Friesen — who gave way to charter member Debbie Kennedy late in the evening. Pianist Conal Fowkes wasn’t there, but two ringers, both clarinetists, gave a truly international flavor: Motoo Yamzaki from Japan, and Adrian Cunningham for Sydney. Eddy used to call this band “Wild Reeds and Wicked Rhythm,” an apt moniker. Orange, Scott, and Eddy (supported by Kelly or Debbie), musicians and friends, have a special chemistry. It is how brilliant soloists can intuitively sense what the band needs, create it on the spot, and send it forth. Scott and Orange, tussling like terrier puppies in a pet-shop window, worked wonderfully together: less aggressively than Soprano Summit or Sidney Bechet and Muggsy Spanier, but with feeling and drive. Orange’s style seems plain, even homespun: his inspirations are New Orleans Albert-system deities, not Goodman’s legions — but his simplicity is deceptive, for he is really a racing-car driver negotiating a tight turn at high speed. Before we know it, Orange has slyly got it and gone. Scott energized us with his beautiful tone, his yearning phrases, his deep well of feeling. Eddy pushed the band — not only rhythmically, but with his cheerful front-porch singing and his needling “Whaddaya got? Whaddaya got?” to urge his colleagues to pick the next tune. For any other jazz group, that performance would have been the high point of the evening, reason enough to go home and take a well-deserved nap. But the Earregulars topped themselves in the second set with a rendition of “Good Old New York,” a very simple Jelly Roll Morton tune that he recorded at the end of his life, in band sessions that endearingly have their hearts set on jukebox hits — which did not happen. The song’s two ascending phrases, four notes apiece, that make up its opening melody, are infuriatingly catchy. After a pulsing statement of the melody, veering between unison playing and collective improvisation, Scott and Orange riffed energetically behind Eddy’s banjo solo; Scott and Kelly then played an unaccompanied duet, leading to a rocking, nearly ecstatic close. Last night at The Ear was equally gratifying, with Jon-Erik Kellso, trumpet; Matt Munisteri, guitar; Joel Forbes, bass; John Allred, trombone. The quartet seemed a little big band, brass and rhythm sections, compact and wasteless. Kellso’s growls, slides, and muted moans were wonderfully in place. Jon pours his heart into every note: although he moves nimbly at fast tempos, each eighth note is a serious matter, with its own weight. Allred’s style bristles with sharply focused thirty-second notes, but his tone gleams, his blues dig in, his ballads sing. Behind them, Matt and Joel worked in idiosyncratic harmony, truly rocking in rhythm. Jon started off with the wittily apt “June Night,” but the music truly became electric with a brisk “Smiles,” an almost-forgotten sentimental song circa 1920, that inspired the band into jam-session polyphony, counterlines, and riffs escalating in intensity. He then asked the singer Catherine Russell, seated at the bar, to join them. 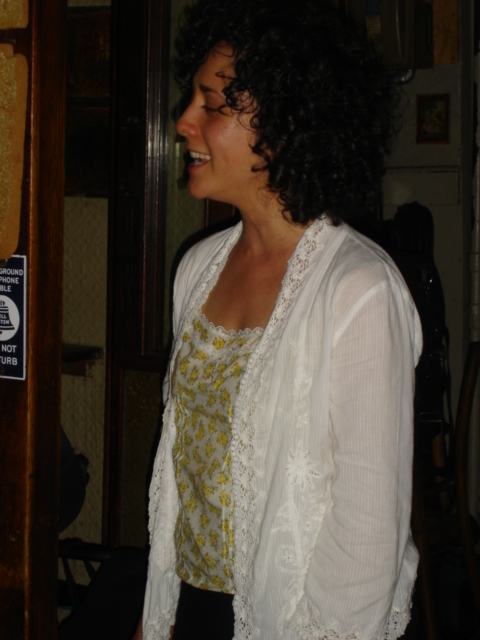 She chose “Won’t You Come Home, Bill Bailey?” — a tune that has had violence done to it by amateurs. Russell is stocky and solid but physically mobile, a playful actress, swaying her body and gesturing as the song indicated. Standing almost in the doorway, she made a spontaneous acting exercise of the lyrics, including the people wandering in and out in her script. It would have been hilarious improvised theatre if she had not sung a word. But Russell’s voice is extraordinary: a huge forceful instrument with power both released and held in reserve. I thought of Bessie Smith and Dinah Washington, but the resemblance was more organic than a collection of phrases copied from records. Singing, Russell can move mountains. But she has more than one approach: on a tenderly sad “I Cover the Waterfront,” with Kellso murmuring behind her, she made us believe the lyrics — honoring Billie Holiday without copying her mannerisms, Then, as if polishing off her imagined homage to jazz singers, she did Fats Waller’s “The Joint is Jumpin’,” with some clever changes to the lyrics. If the joint hadn’t been jumping before, it certainly was now. The essayist Lorna Sass, whose most recent book won the James Beard Award, said excitedly, “They were cooking!” She knows. The second set began with a luxuriant exploration of “Struttin’ With Some Barbecue,” complete with verse, and the Earregulars, perhaps still thinking of Fats, went into a slow-drag “Squeeze Me” that suggested the great recording Buck Clayton, Vic Dickenson, and Kenny Burrell made for Vanguard, with honors going to Matt, whose solo evoked Jimmy Ryan’s 1942 and deep rural folk music at the same time, sometimes in the same phrase. 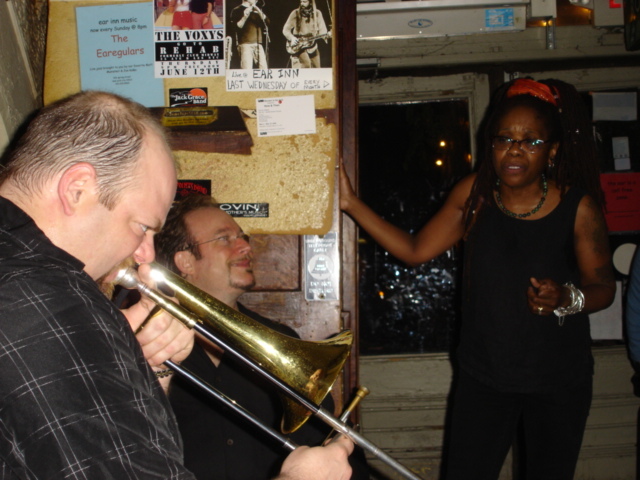 A romping three-trombone “Sweet Georgia Brown,” featuring Allred, Harvey Tibbs, and Matt McDonald followed (Kellso sat happily watching). After a deeply Ellingtonian “Just Squeeze Me,” where the three trombones played choral held notes behind Joel’s solo, Jon called up the singer Tamar Korn, known for her work as part of the Cangelosi Cards. I’ve written about Korn on a previous posting, when she came to the Ear and astonished everyone with a slow-tempo “Dinah,” so I couldn’t wait to hear her sing “Exactly Like You.” She is tiny and looks doll-like, but she’s clearly a hip urban doll; no Disney figurine, she. While the band played, Korn tapped her foot and wiggled, but in miniature. When she sang, she was intent, still, serious, gathering all her energy in her voice, which was focused but not at all tiny. Her approach is slippery, quicksilver: by the time a listener has said, “Was that a yodel?” or “That’s operatic,” or “She sounds like smeone on the Grand Old Opry,” the phrase is long gone — one runs behind Korn’s voice, trying to catch up with the beauties she has spread before us. “Exactly Like You” was all rocking sincerity: we knew that Mother HAD raught her to be true, and she didn’t need chorus after chorus to prove it. She then surpassed herself with a simple, eloquent, deeply felt reading of “Stardust,” which silenced most of the front room. What she sang transcended the song; we stopped listening to notes and words; we were swept up in her vision of lonely nights and memories. Sitting near me, Joyce Metz turned to her husband Ed (the noted jazz drummer) and lightly struck her sternum a few times with her fist, gently, to say, “That came from the heart.” It certainly did. A postscript: the Earregulars, even before they had a name, played their first Sunday night gig at 326 Spring Street on June 17, 2007. I don’t know if next Sunday, June 15, is therefore a birthday or an anniversary (correct me, readers) but I hope to be there to join the cheering throng. 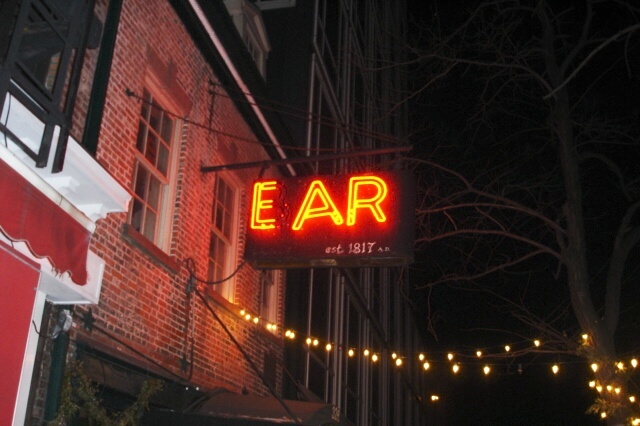 However, and I find this pleasing, amusing, and just slightly annoying, The Ear Inn has now become so popular that people are calling for reservations. But you will understand why in the first ten minutes of any Sunday night there.